Life, like the roads of Newfoundland’s coast, can sometimes take a hard turn… More than 500 soldiers who served in Afghanistan came back wounded in both body and mind. Mines, improvised explosive devices, motor vehicle accidents, enemy fire: these are the realities of a mission fraught with dangers – each of them unpredictable. The road to recovery for those injured in war is a long one. In 2010, two wounded soldiers tested their limits and sped for the finish line. When Master Corporal Jody Mitic and Corporal Andrew Knisley signed up to go to Afghanistan, they were full aware of both the danger and the importance of their mission – one that was to mark their lives forever. On January 11, 2007, Mitic stepped on a landmine and lost both legs below the knee. Two years later, on January 19, 2009, an improvised explosive device severed Knisley’s leg, and he lost the partial use of one arm. Shock. Hospitalization. Rehabilitation. A tough journey that not everyone can hack. And yet, Mitic and Knisley overcame at times overwhelming challenges to recovery. They got back into shape and back on track with the support of the Canadian Forces Soldier On program, which aims to improve the quality of life of injured soldiers through fitness, recreation and sport. 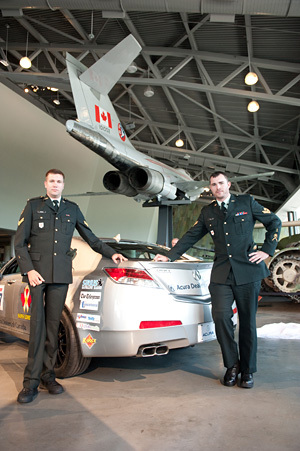 In March of 2010, while they were participating in the opening ceremonies of the Vancouver Paralympic Games, the pair first learned about the Targa Newfoundlandland rally. Knisley, a true speed demon, instantly recognized a challenge worth taking on…and Mitic didn’t hesitate to join him! With the help of Major-General Lewis Mackenzie, himself a race car driver, they received support from a number of quarters: Honda Canada supplied an Acura TL sportscar; Targa Newfoundland waived the entry fee; the Ottawa Motorsport Club offered training in auto racing. In less than six months, Mitic and Knisley were ready to roll…all the way to a winning finish! September 18, 2010, they came in first in their category and 7th overall, earning more than $100,000 for the Soldier On Fund. Before they could pull off their remarkable victory, Mitic and Knisley had to overcome a great many obstacles. But their strength of character – coupled with the support of friends and the Canadian Forces – helped them look beyond the difficulties in their path. Physical and psychological injuries are an unfortunate reality, and the road to recovery can be a long and arduous one. Saving lives, treating illness and rehabilitating the injured – these are among the difficult but incredibly important duties of the health practitioners who attend to injured military personnel and civilians. To highlight this vital contribution, the Canadian War Museum will explore the uneasy and evolving relationship between warfare and health care over the past 150 years. Opening May 27, 2011, the War and Medicine exhibition will take visitors on a journey through care and conflict.